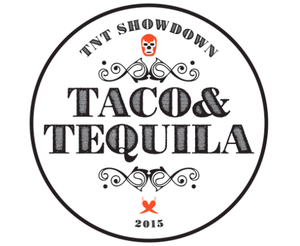 Taco & Tequila Showdown at the Vagabond on Monday November 8 (6pm-9pm). Presented by MIAbites and The Liquid Projects, the event will pair 12 chefs creating signature tacos with 12 bartenders creating signature tequila cocktails. If you don't get into the Cobaya dinner that night, this might be a good Plan B: about half the chef participants are Cobaya alumni. Tickets ($65) available at Eventbrite. P.I.G. 6 in Wynwood on Sunday, November 15 (3pm-7pm). This shindig in celebration of the pig, orchestrated by Chef Jeremiah Bullfrog of the gastroPod, is always one of my favorites every year. Participants this year include Kyle Foster of Denver's Colt & Gray (and before that, my beloved Talula), Craig Deihl of Charleston's Cypress, plus locals Giorgio Rapicavoli of Eating House, Steve Santana of Taquiza, Todd Erickson of Haven and HuaHua's, Roel Alcudia (formerly Cypress Room), Brian Mullins of Ms. Cheezious, Aaron Brooks of Edge, Brad Kilgore of Alter, James Strine of Café Boulud, and Mike Pirolo of Macchialina and Bazi. 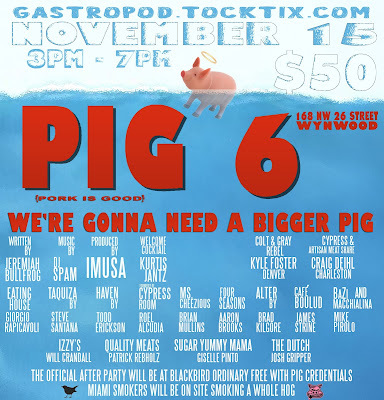 Tickets ($50) available through Tock. By the way: these types of events always get put on the FFT calendar but are usually not the subject of a post – I've tried to use blog posts only for actual content. But if you, dear reader, find these type of posts useful (or conversely, annoying), please speak up. Thanks. Some of the most interesting meals I've had in Miami have come out of a truck or shipping container – the various reincarnations of Chef Jeremiah Bullfrog's gastroPod. Its latest iteration – a shipping container stationed on a lot in Wynwood – took a temporary hiatus for a few months on account of permitting issues, but returned this past week. A friend orchestrated a little "welcome back" dinner, and Chef Jeremiah orchestrated the menu, which included ember-cooked, tempura-fried, porcini-dusted sweet potatoes, fancy musubi with "center cut" spam, crispy nori and fish roe, and a salad featuring absinthe-cured salmon belly, among other things. 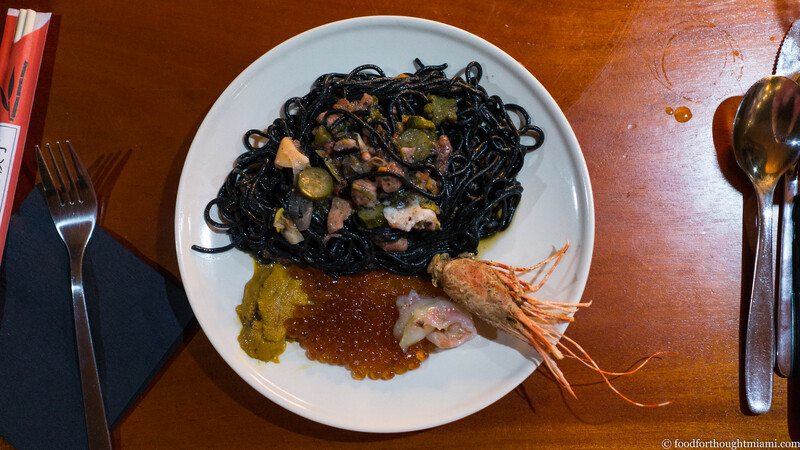 But my favorite was a pasta course of jet-black squid ink noodles tossed with braised octopus and the octopus' braising liquid, served chirashi style with ama ebi, uni, and ikura cured with sake and soy. The Italian-Japanese hybrid was the best thing I ate last week. 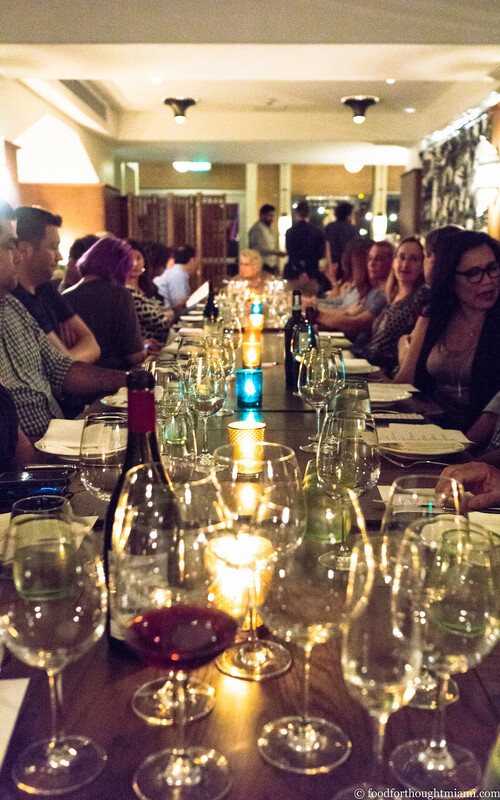 (You can see all my pictures from the dinner in this gastroPod 2.5 flickr set). Runners-up: the lobster poutine at recently-opened Izzy's Fish and Oyster; the secretive,Texas meets Mexico (but not Tex-Mex) BBQ at Barbacoa (I'm not at liberty to disclose the details); the eggplant-stuffed manti dumplings in a creamy yogurt sauce at Byblos. 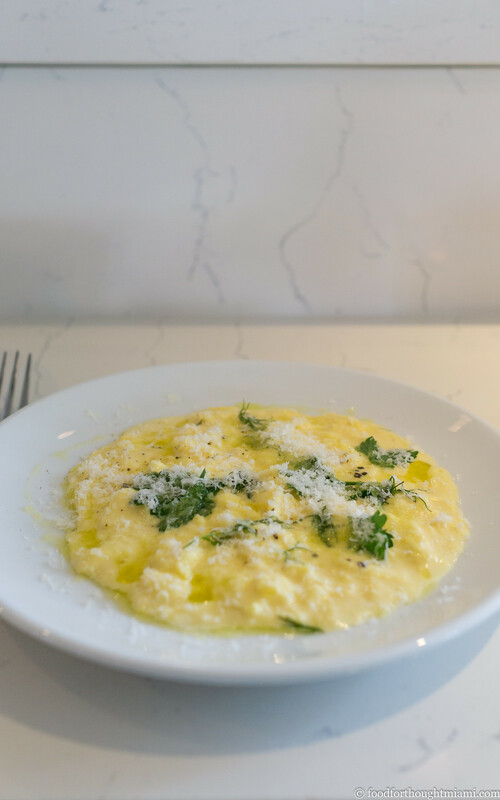 It doesn't sound like much the way it's listed on the menu: "soft scrambled eggs, fines herbes, pecorino, evoo." It looks like even less: a shallow plate of runny eggs that might have been scooped up from some budget hotel's breakfast buffet. Don't be fooled. This, from the brunch menu at Alex Chang's Vagabond, is luxurious stuff. The eggs are warmed through but still virtually liquid, barely forming any curds. The texture is like silk, the flavor rich and pure. A few more grace notes: a tangle of fresh herbs, a dusting of salty pecorino cheese, a drizzle of good olive oil to sort of round everything out. I just loved this. It was the best thing I ate all week. And it's only $7. (Pro tip: Vagabond's home made English muffins make a good vehicle for scooping). 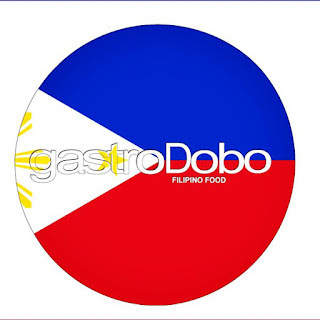 It's hard for me to believe that it was more than four years ago that one of my favorite chefs, Michelle Bernstein, agreed to do a Cobaya dinner with us. Not that the folks who had done the eleven dinners before her were slouches, but here was one of Miami's most celebrated chefs: a James Beard award winner running one of the top restaurants in town. This, for us, was the big leagues. Even now, with more than forty more "experiments" under our collective belts (which may be set to a wider notch these days), that dinner in the atrium of the Melin Building still stands out as one of the most memorable – not just for the food (which was excellent) but for Michelle's eagerness to do it and the grace with which it was executed. But for Experiment #56, though we were in Seagrape, the restaurant in the Thompson Hotel that Bernstein opened last year, it would not be her dinner. Rather, the spotlight was on Jason Schaan, the hotel executive sous chef, and Tony Velazquez, the restaurant's chef de cuisine. Schaan goes way back with Michelle: he worked the line when she was at Azul and made his way up to CDC at Michy's (and was also in the kitchen for that Cobaya dinner back in 201). Velazquez is a recent addition to the team, but another Cobaya veteran, having worked at 1500° when they did Experiment #27. The menu Schaan and Velazquez put together was a fitting match to the mid-century modern style of the venue, balancing classical elegance with some contemporary flourishes. (You can see all my pictures in this Cobaya Seagrape flickr set; unfortunately the lighting situation was far from ideal and my pictures are pretty awful). 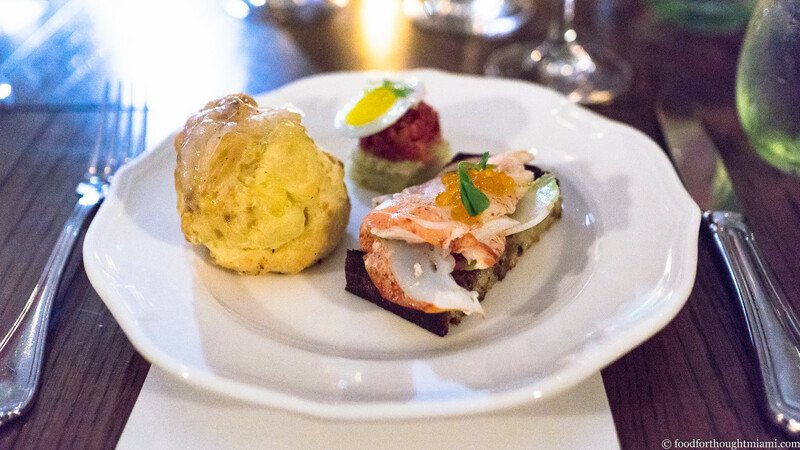 Once we were all settled into a private dining area next to the main dining room, a trio of canapes started things off. A puffy gougère, draped with a sheet of translucent lardo, concealed a molten core of gooey, mushroom-y L'Explorateur cheese. Tender ribbons of Maine lobster were draped over toast slathered with salted butter, given fresh crunch by shaved radishes and briny pop by a dollop of trout caviar. Rich Masami wagyu beef belly tartare, perked up with some chorizo, was mounded onto a round of brioche, drizzled with bearnaise sabayon, and topped with a fried quail egg. I love a good vitello tonnato, the classic Italian dish that combines cold, thinly sliced veal with a caper-flecked mayo gone piscine with the addition of canned tuna. I know, it seems like it would be awful, but for reasons I can't quite explain, it all works. 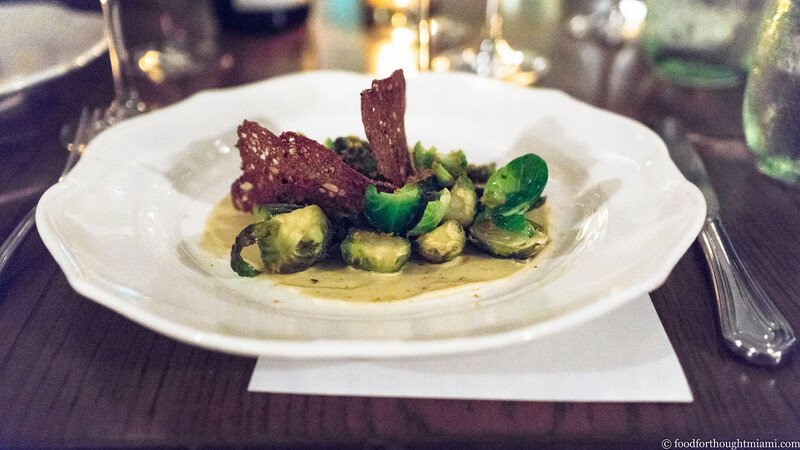 So I was intrigued to see Jason and Tony do a variation with brussels sprouts, with that funky, fishy quality amplified by a shaving of bottarga over the top. A bit behind schedule here, as it's already Friday, but better late than never. Last Tuesday we held our 56th Cobaya dinner, this time with chefs Jason Schaan and Tony Velazquez at Michelle Bernstein's Seagrape in the Thompson Hotel on Miami Beach. A full update will be coming shortly, but here let me just talk about my favorite dish of the night: their pasta vongole. This was no garden variety linguine and clam sauce. 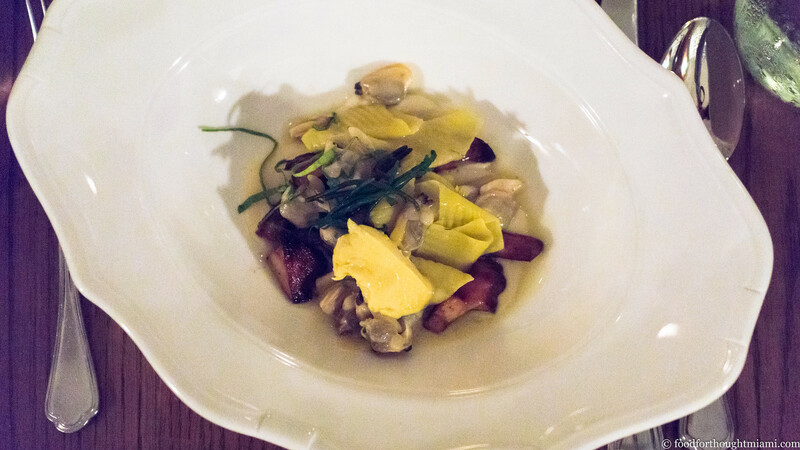 Here was hand rolled garganelli nestled among a couple different kinds of clams (manila clams and venus clams), batons of salsify and roasted mushrooms, a tangle of sea beans, with a generous knob of silky, oceanic uni butter mounted on top as it was served. It was a great mix of surf and earth, and the best thing I ate last week. Somehow, I had let a year go by since my last visit to Eating House, Giorgio Rapicavoli's pop-up gone permanent on the northern edge of Coral Gables. That was dumb of me. This past weekend I grabbed a solo spot at the bar after both wife and daughter had abandoned me for the evening, and sampled as much as I could of the current menu. 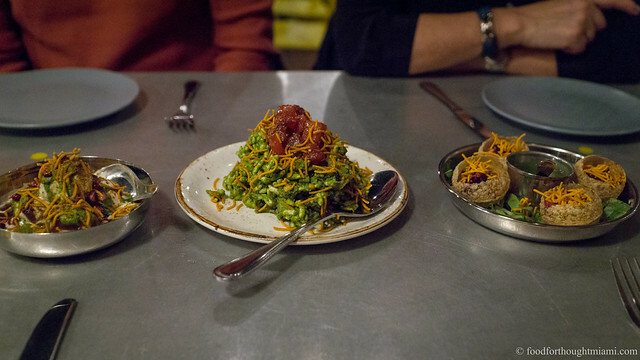 Some staples remain: the tomatoes with coconut ice and Vietnamese flavors, the chicken and "foi-ffles," the over-the-top pasta carbonara. But everything else around the edges is new – and very good. Vegetable-focused dishes in particular are a strong suit, and of these, my favorite was a plate of grilled carrots, blanketed in soft curls of a powerfully rich five-year aged gouda cheese (it gets crystals like a good aged parmigiano-reggiano), dappled with crunchy buckwheat kernels, all resting atop a pillow of a creamy carrot-top pesto. 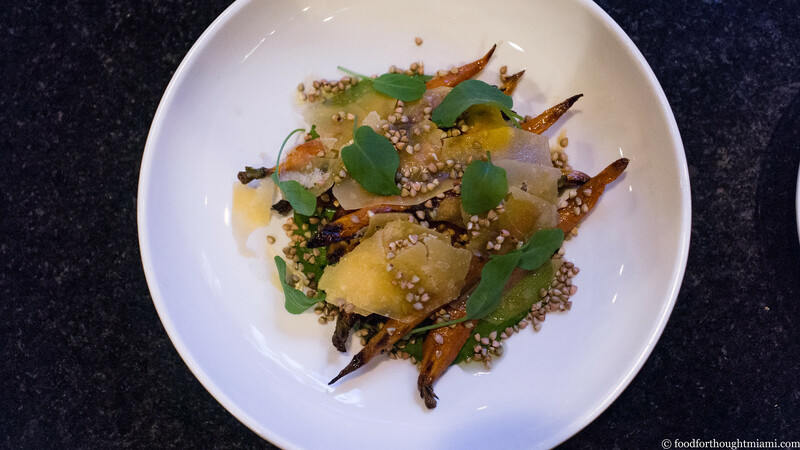 I especially liked that the carrots were not annihilated, but maintained a not-quite-raw but still firm core – so you get both clean, vegetal snap and dark, sweet roasty caramel flavors. It was the best thing I ate last week. Runners-up: the blistered shishito peppers showered with cured egg yolk and dry olive at Eating House; the flaky malawach bread (a Yemenite specialty) served with spicy hariff, grated tomatoes, feta cheese and hard boiled egg for brunch at 27 Restaurant (especially good when accompanied by a Miso Honey Cold Brew).